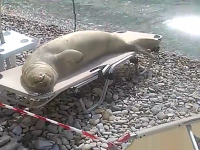 The Mediterranean monk seal enjoys the sun. She sunbathing on lounger. The hotel staff made her a private beach.